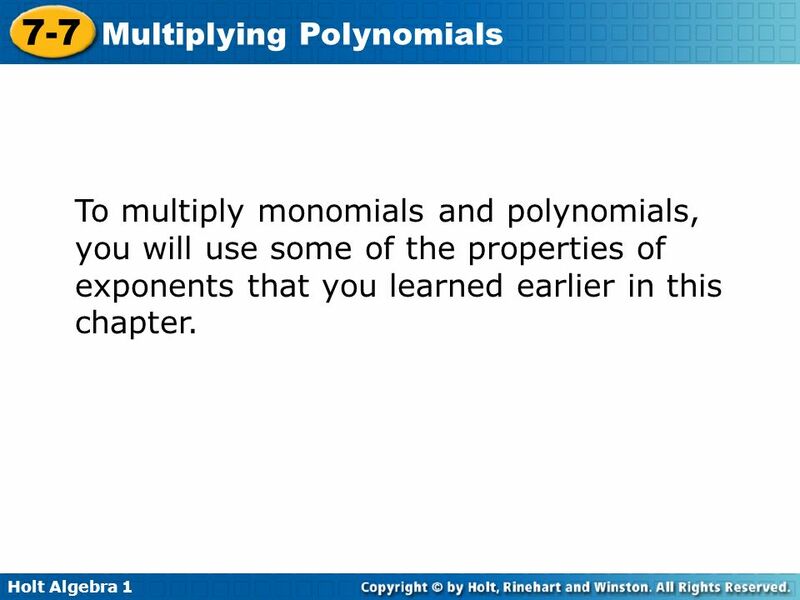 4 To multiply monomials and polynomials, you will use some of the properties of exponents that you learned earlier in this chapter. A. 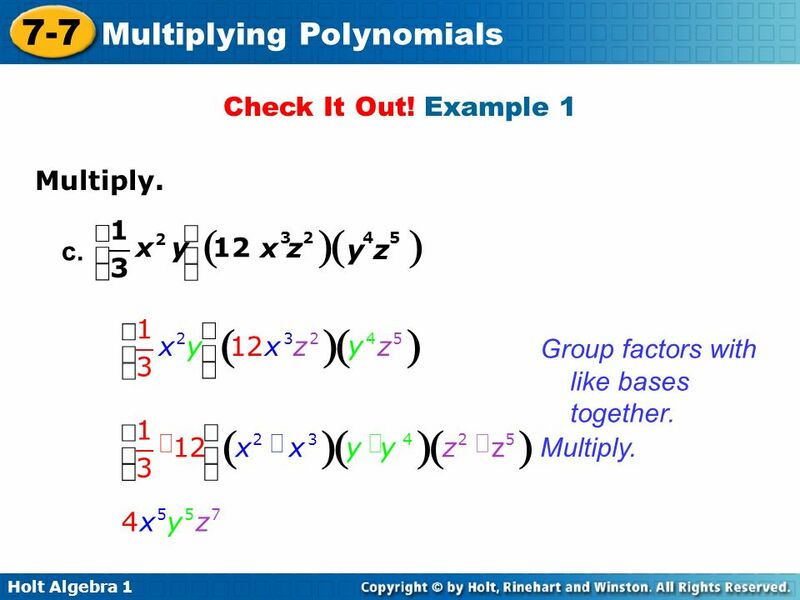 (6y3)(3y5) (6y3)(3y5) Group factors with like bases together. (6 3)(y3 y5)  18y8 Multiply. B. 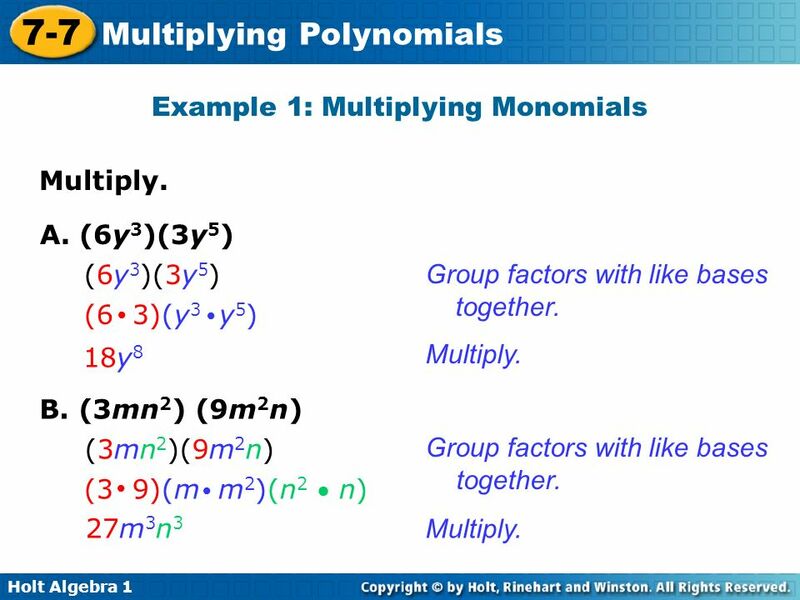 (3mn2) (9m2n) (3mn2)(9m2n) Group factors with like bases together. (3 9)(m m2)(n2  n)  27m3n3 Multiply. ( ) æ ç è - 2 1 12 4 t s ö ÷ ø Group factors with like bases together. ( ) g æ - ö ç è 2 1 12 4 t s ÷ ø Multiply. 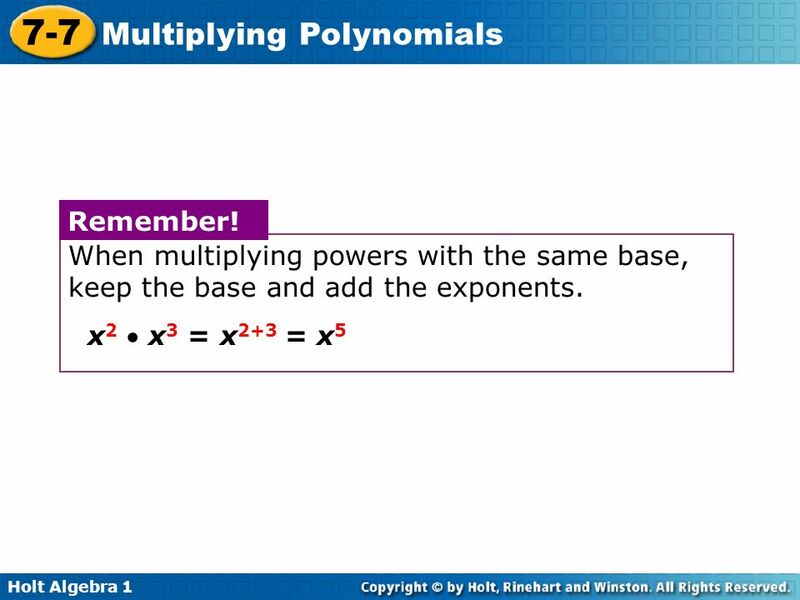 7 When multiplying powers with the same base, keep the base and add the exponents. x2  x3 = x2+3 = x5 Remember! 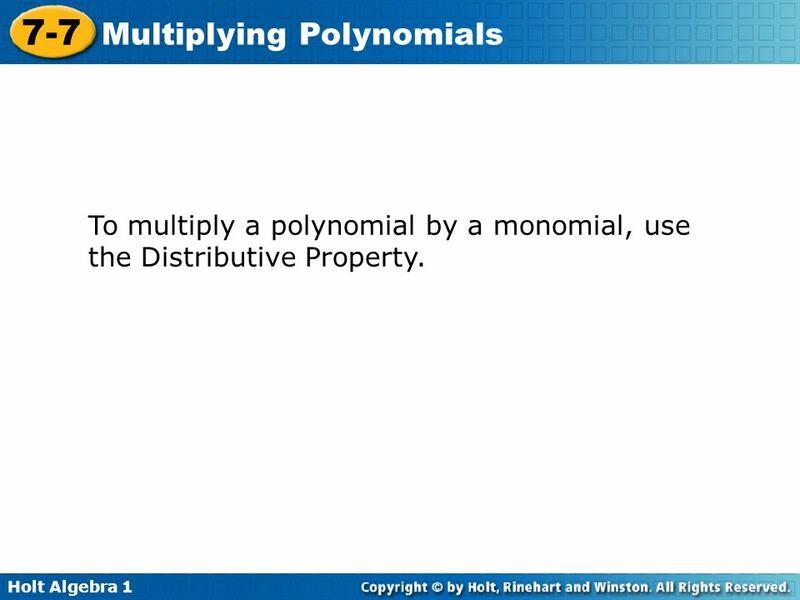 10 To multiply a polynomial by a monomial, use the Distributive Property. 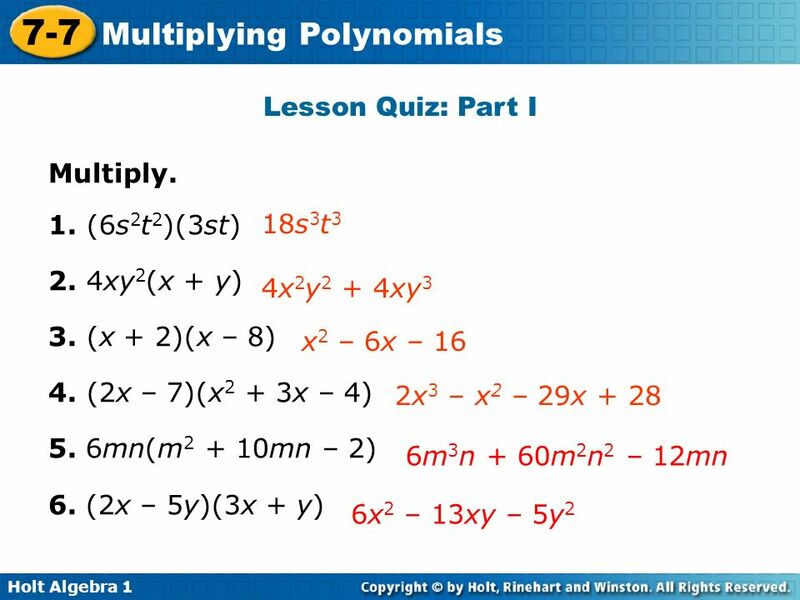 6pq(2p – q) (6pq)(2p – q) Distribute 6pq. 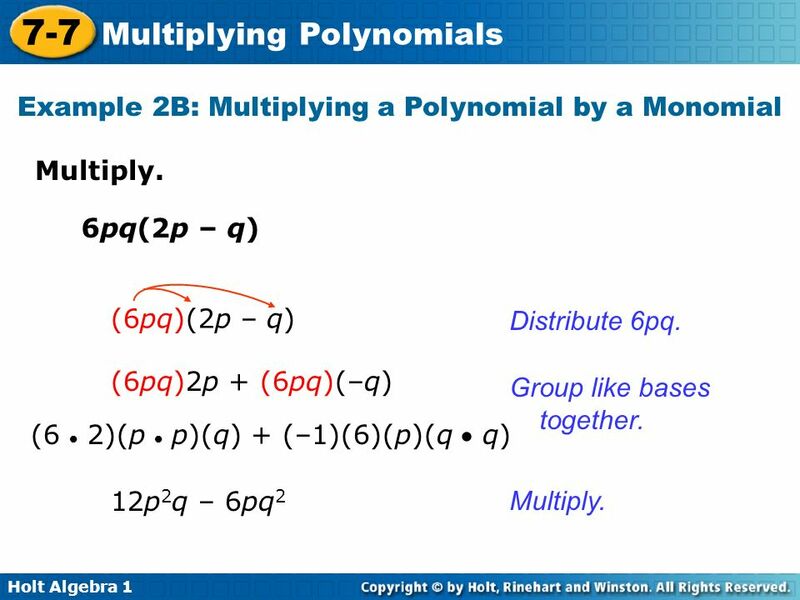 (6pq)2p + (6pq)(–q) Group like bases together. (6  2)(p  p)(q) + (–1)(6)(p)(q  q) 12p2q – 6pq2 Multiply. 1 ( ) x y 2 6 xy + 8 x y 2 2 2 x y ( ) + 2 6 1 xy y x 8 Distribute 2 1 x y x y x y ( ) æ ç è + 2 1 6 8 xy ö ÷ ø Group like bases together. x2 • x ( ) æ + ç è 1 • 6 2 y • y x2 • x2 y • y2 • 8 ö ÷ ø 3x3y2 + 4x4y3 Multiply. 15 Check It Out! 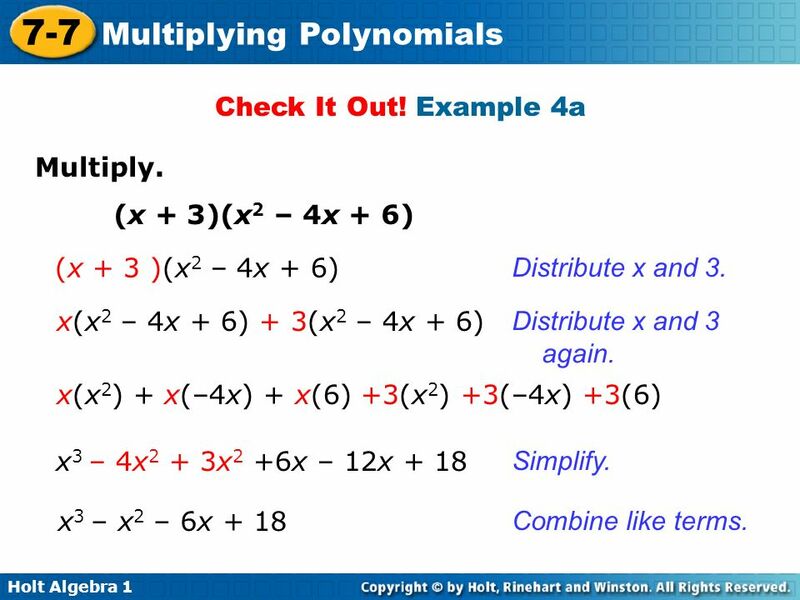 Example 2 Multiply. b. 3ab(5a2 + b) 3ab(5a2 + b) Distribute 3ab. 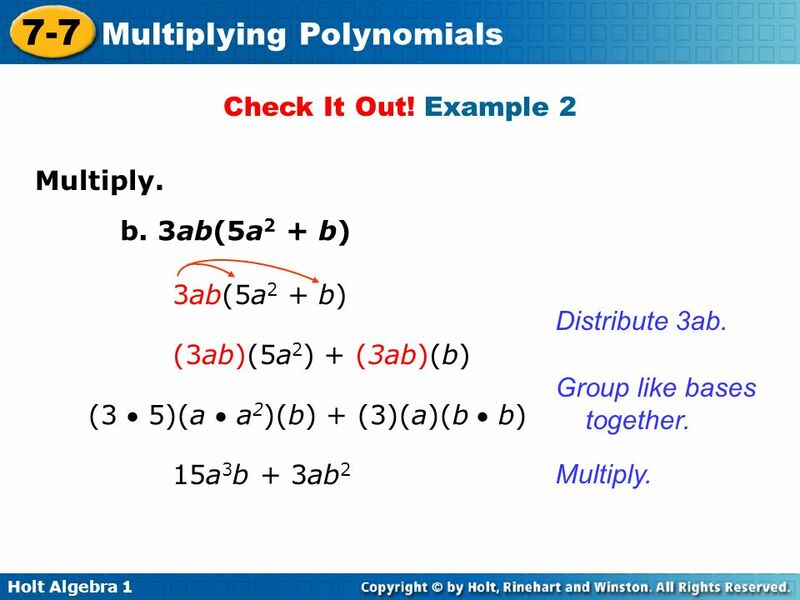 (3ab)(5a2) + (3ab)(b) Group like bases together. (3  5)(a  a2)(b) + (3)(a)(b  b) 15a3b + 3ab2 Multiply. 16 Check It Out! 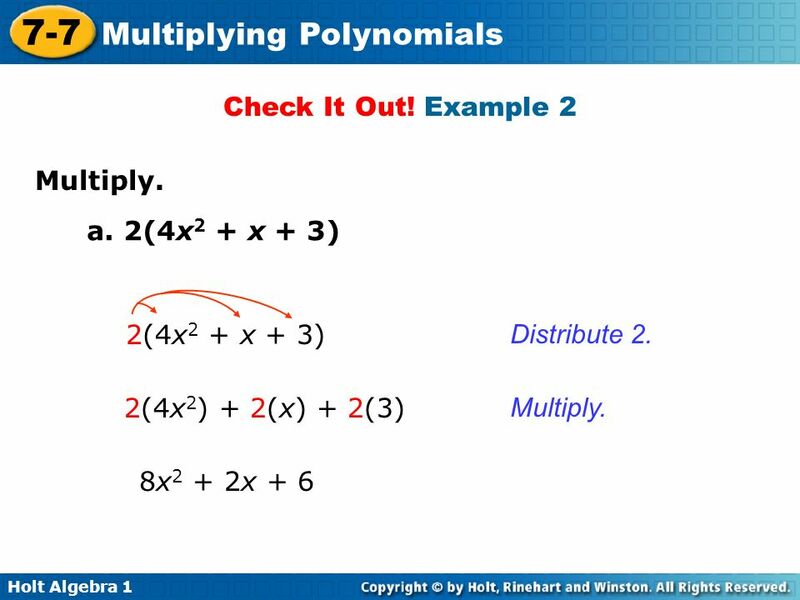 Example 2 Multiply. c. 5r2s2(r – 3s) 5r2s2(r – 3s) Distribute 5r2s2. 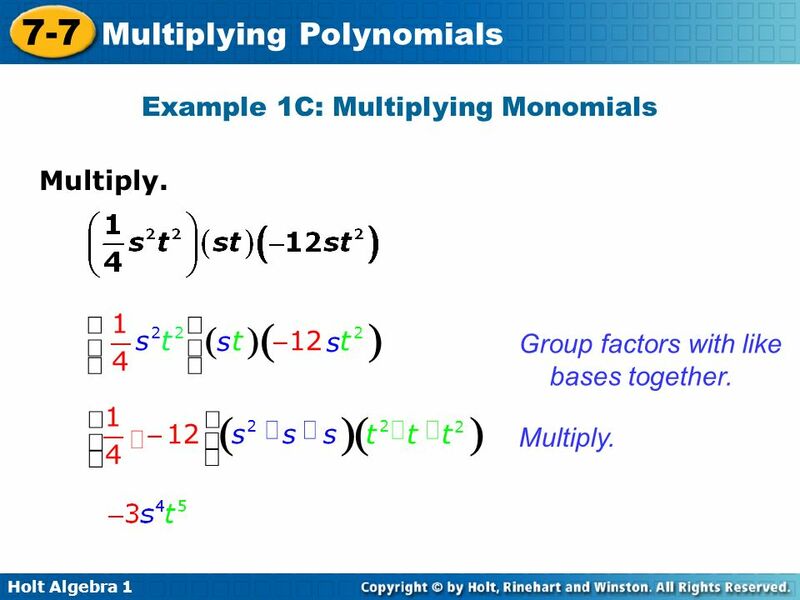 (5r2s2)(r) – (5r2s2)(3s) Group like bases together. 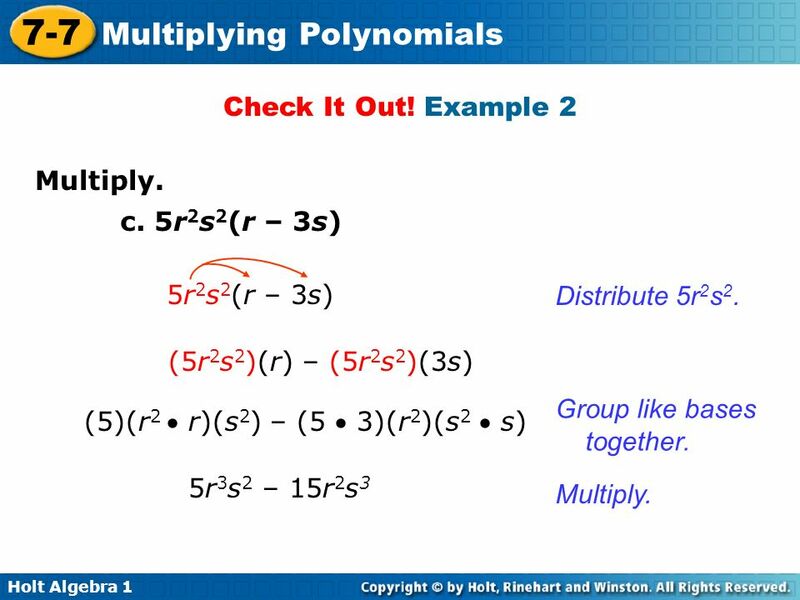 (5)(r2  r)(s2) – (5  3)(r2)(s2  s) 5r3s2 – 15r2s3 Multiply. 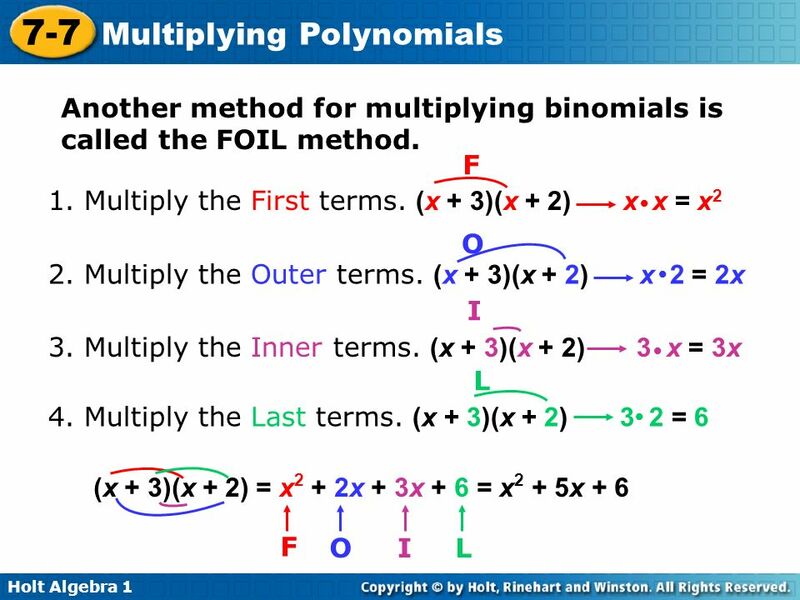 18 Another method for multiplying binomials is called the FOIL method. (s + 4)(s – 2) (s + 4)(s – 2) s(s – 2) + 4(s – 2) Distribute s and 4. s(s) + s(–2) + 4(s) + 4(–2) Distribute s and 4 again. s2 – 2s + 4s – 8 Multiply. 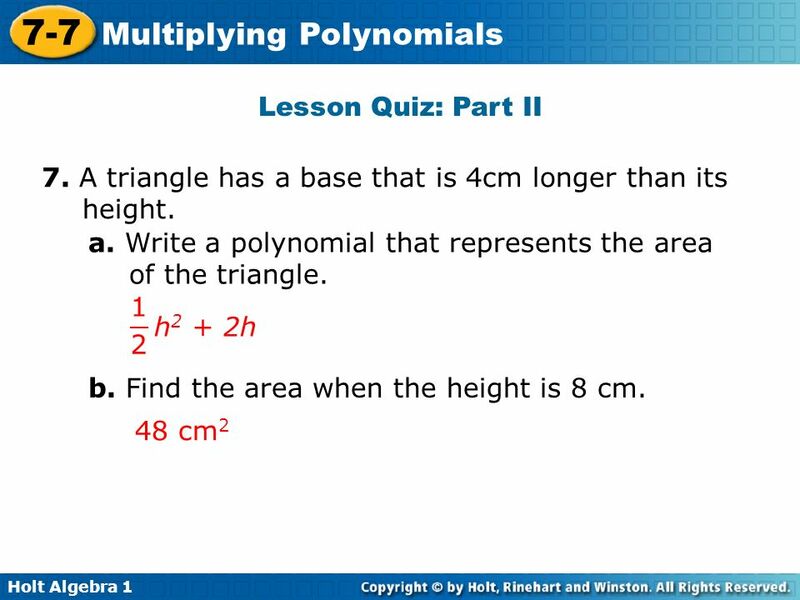 s2 + 2s – 8 Combine like terms. 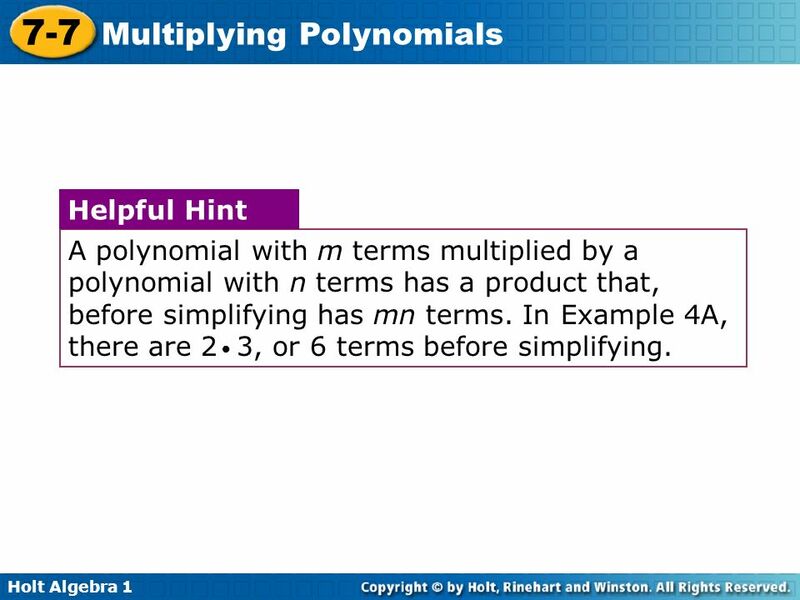 Write as a product of two binomials. 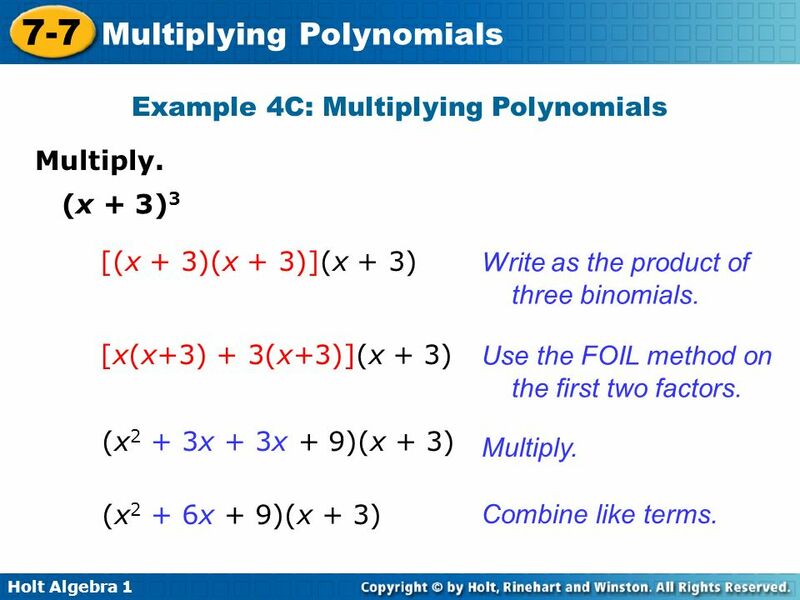 (x – 4)2 (x – 4)(x – 4) Use the FOIL method. (x x) + (x (–4)) + (–4  x) + (–4  (–4))  x2 – 4x – 4x + 8 Multiply. x2 – 8x + 8 Combine like terms. 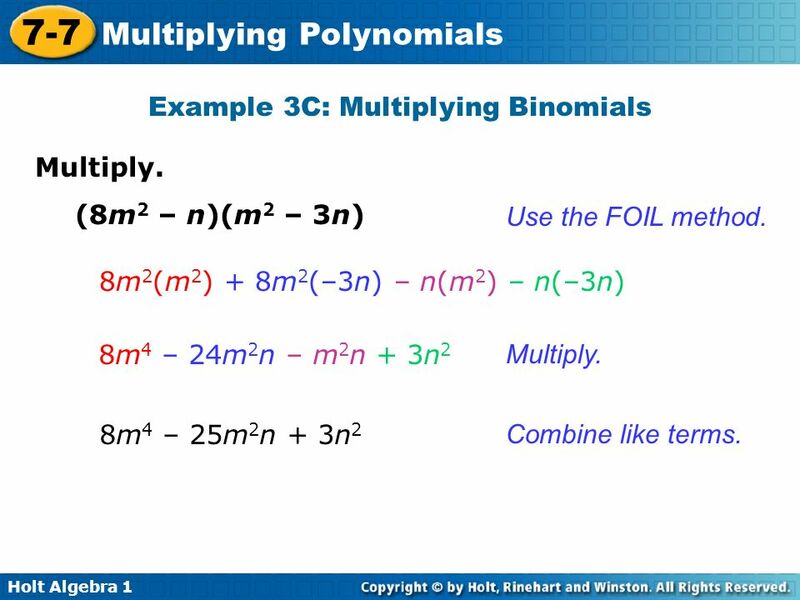 (8m2 – n)(m2 – 3n) Use the FOIL method. 8m2(m2) + 8m2(–3n) – n(m2) – n(–3n) 8m4 – 24m2n – m2n + 3n2 Multiply. 8m4 – 25m2n + 3n2 Combine like terms. 23 Check It Out! 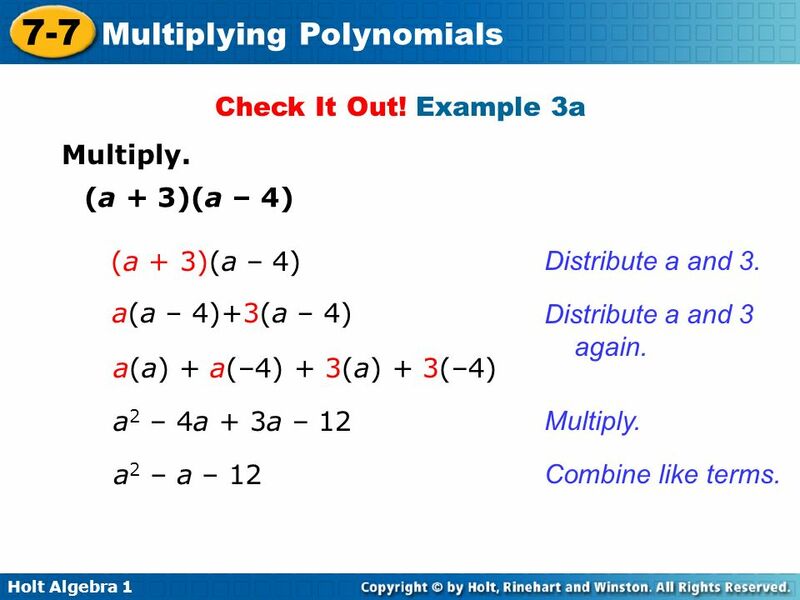 Example 3a Multiply. (a + 3)(a – 4) (a + 3)(a – 4) Distribute a and 3. a(a – 4)+3(a – 4) Distribute a and 3 again. a(a) + a(–4) + 3(a) + 3(–4) a2 – 4a + 3a – 12 Multiply. a2 – a – 12 Combine like terms. Check It Out! 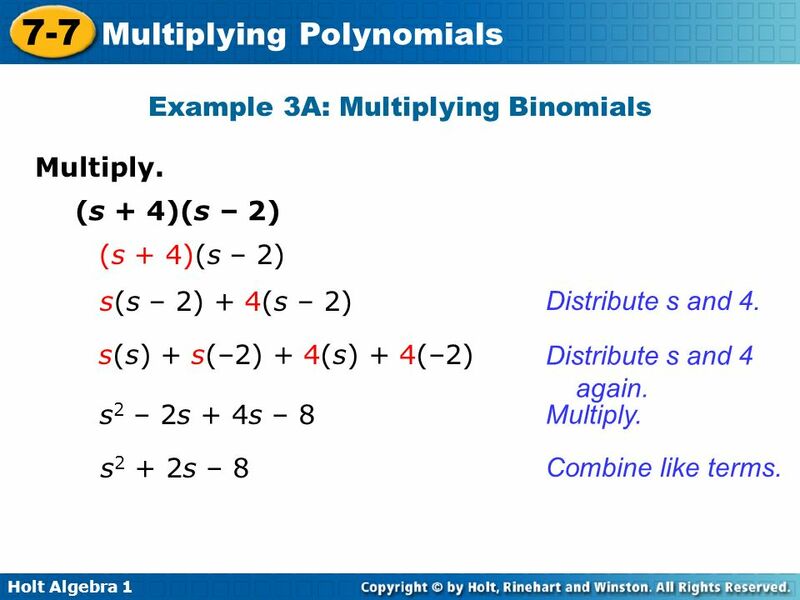 Example 3b Multiply. 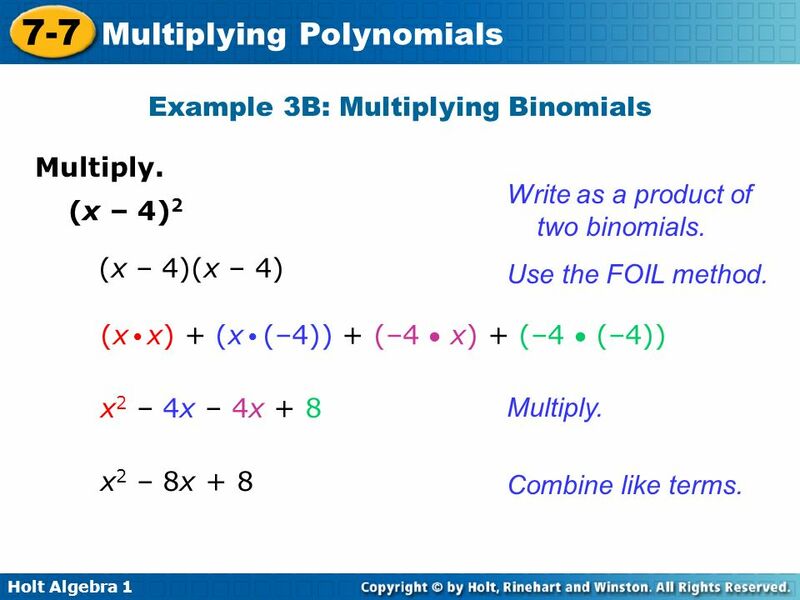 Write as a product of two binomials. 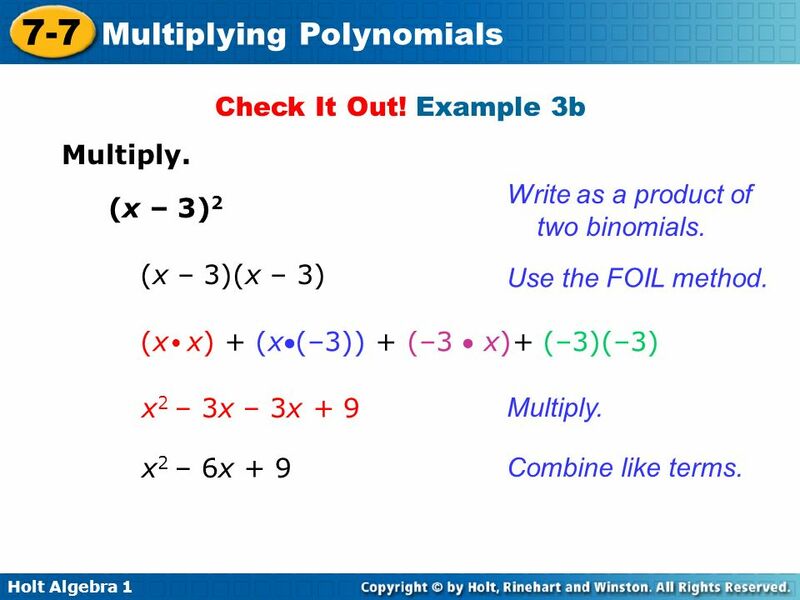 (x – 3)2 (x – 3)(x – 3) Use the FOIL method. (x x) + (x(–3)) + (–3  x)+ (–3)(–3) ● x2 – 3x – 3x + 9 Multiply. 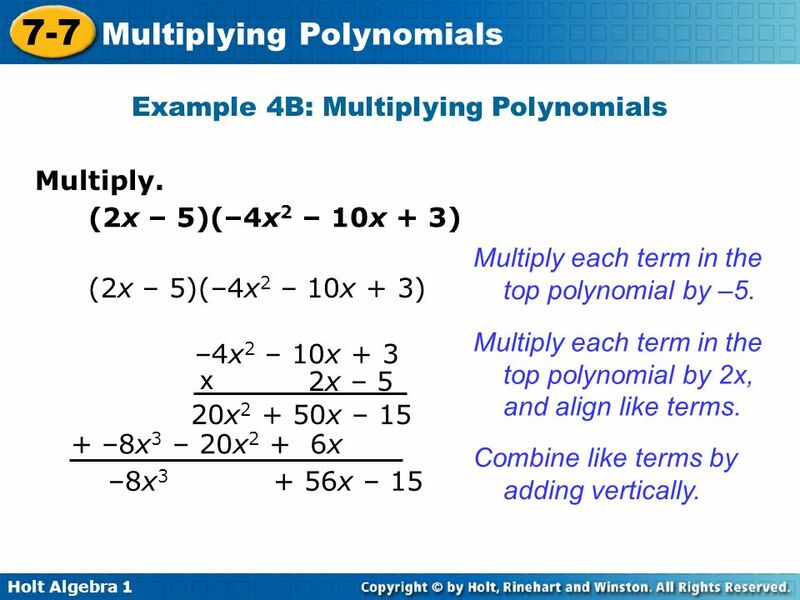 x2 – 6x + 9 Combine like terms. 25 Check It Out! 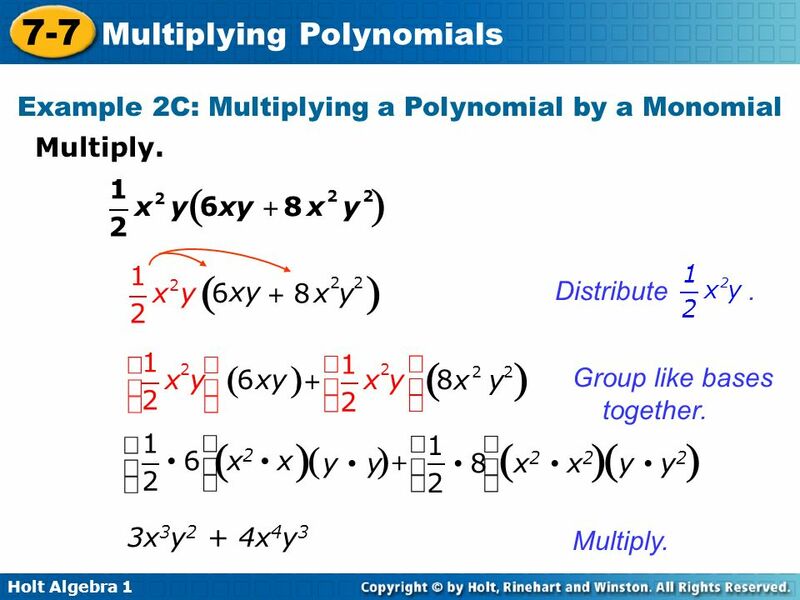 Example 3c Multiply. 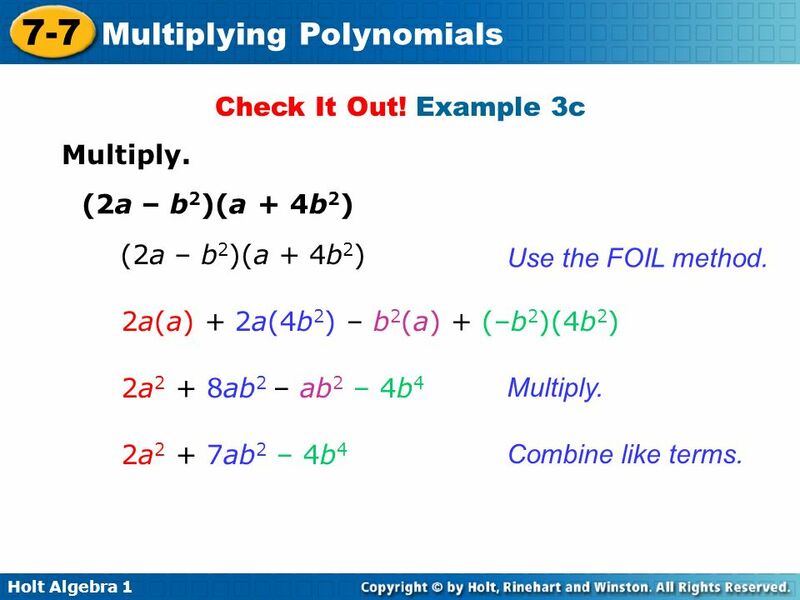 (2a – b2)(a + 4b2) (2a – b2)(a + 4b2) Use the FOIL method. 2a(a) + 2a(4b2) – b2(a) + (–b2)(4b2) 2a2 + 8ab2 – ab2 – 4b4 Multiply. 2a2 + 7ab2 – 4b4 Combine like terms. 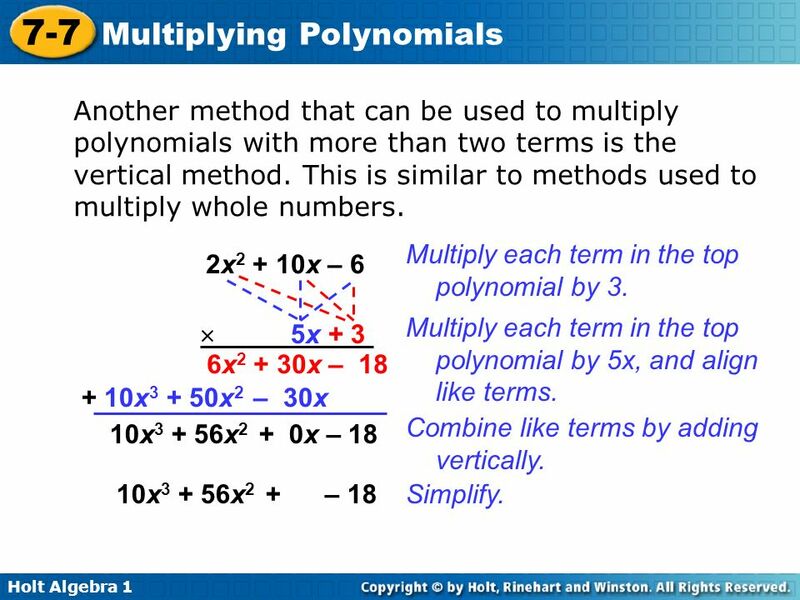 28 Another method that can be used to multiply polynomials with more than two terms is the vertical method. 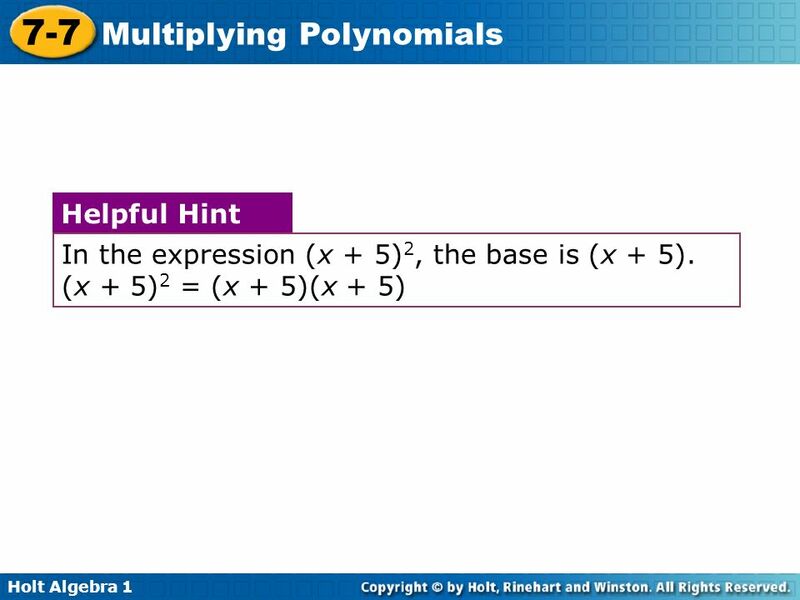 This is similar to methods used to multiply whole numbers. 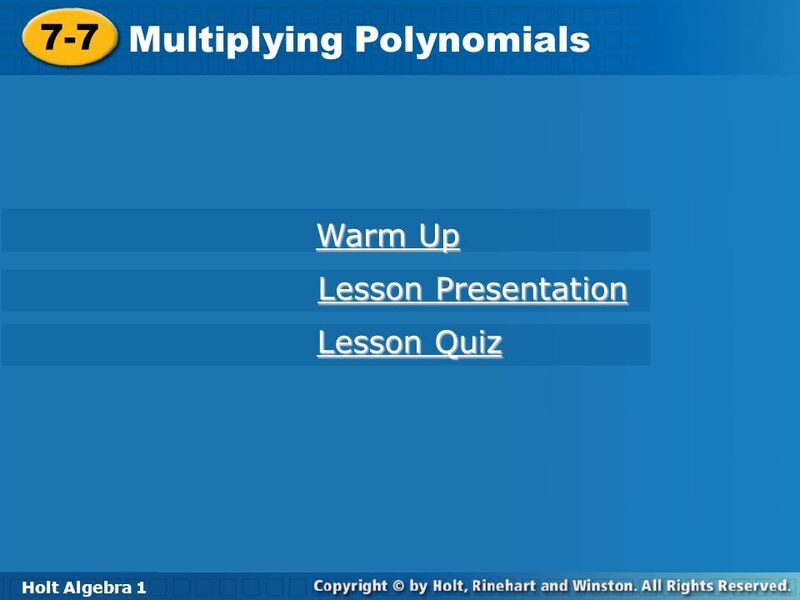 Multiply each term in the top polynomial by 3. 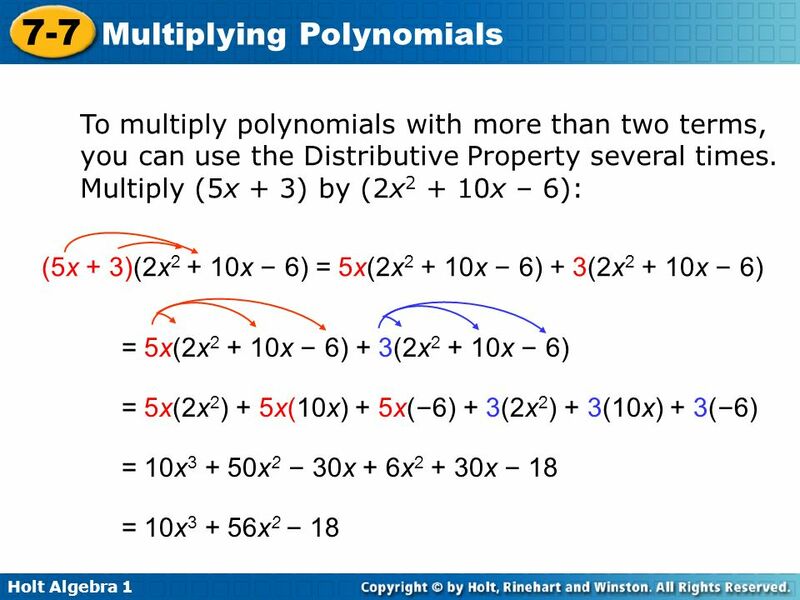 2x2 + 10x – 6 5x + 3  Multiply each term in the top polynomial by 5x, and align like terms. 6x2 + 30x – 18 + 10x3 + 50x2 – 30x Combine like terms by adding vertically. 10x3 + 56x x – 18 10x3 + 56x – 18 Simplify. (x – 5)(x2 + 4x – 6) (x – 5 )(x2 + 4x – 6) Distribute x and –5. x(x2 + 4x – 6) – 5(x2 + 4x – 6) Distribute x and −5 again. x(x2) + x(4x) + x(–6) – 5(x2) – 5(4x) – 5(–6) x3 + 4x2 – 5x2 – 6x – 20x + 30 Simplify. x3 – x2 – 26x + 30 Combine like terms. 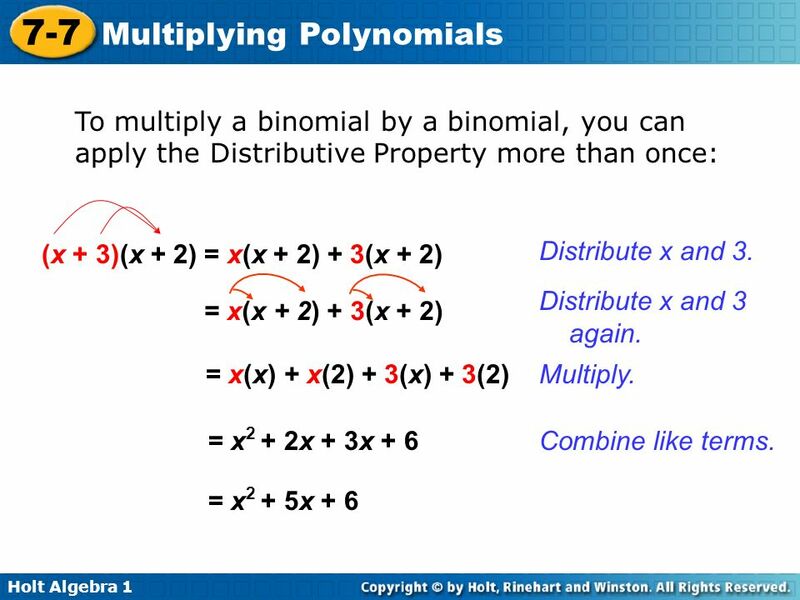 [(x + 3)(x + 3)](x + 3) Write as the product of three binomials. 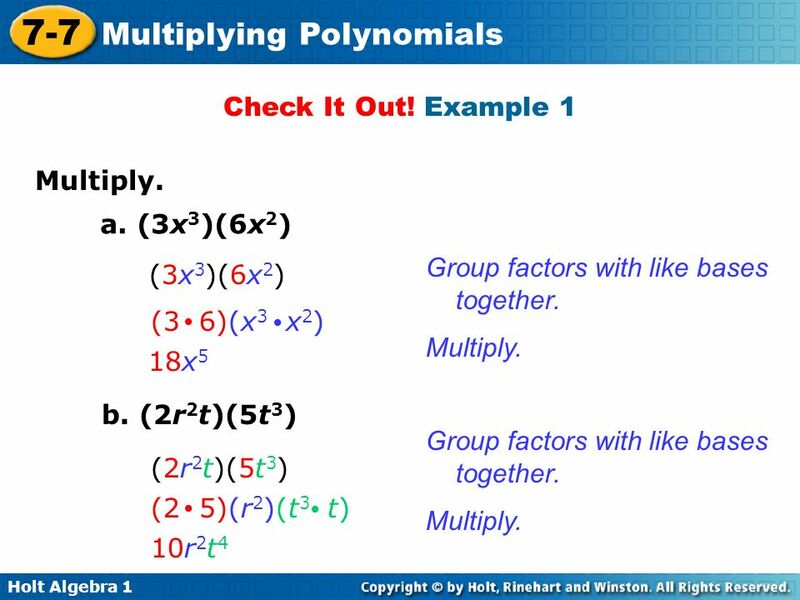 [x(x+3) + 3(x+3)](x + 3) Use the FOIL method on the first two factors. (x2 + 3x + 3x + 9)(x + 3) Multiply. (x2 + 6x + 9)(x + 3) Combine like terms. 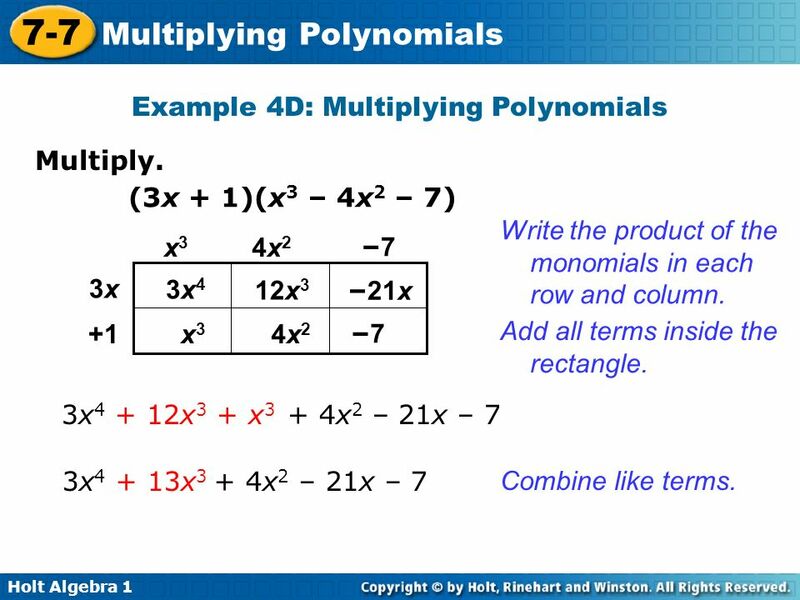 (3x + 1)(x3 – 4x2 – 7) Write the product of the monomials in each row and column. 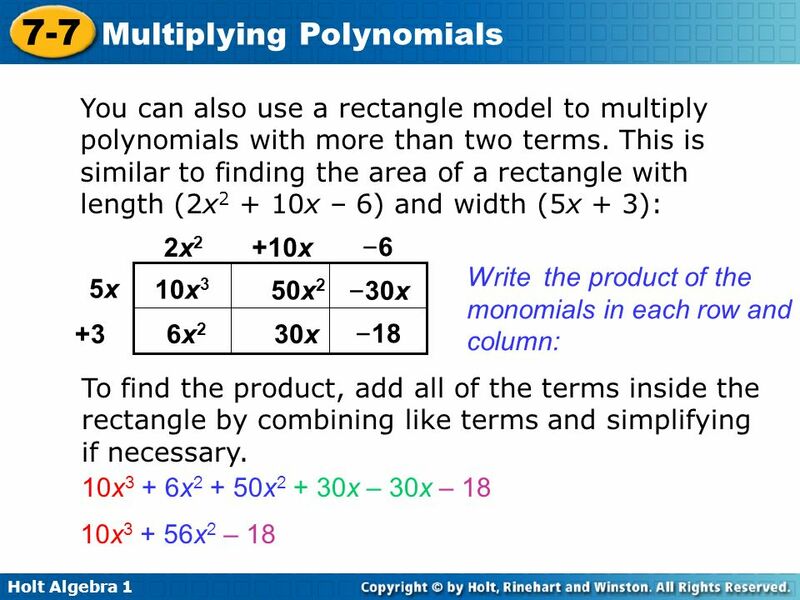 x3 4x2 –7 3x 3x4 12x3 –21x +1 4x2 x3 –7 Add all terms inside the rectangle. 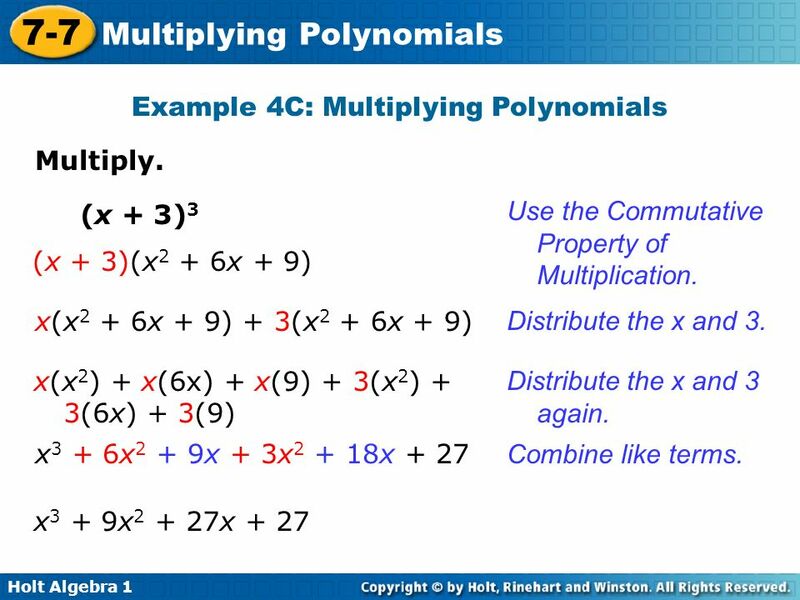 3x4 + 12x3 + x3 + 4x2 – 21x – 7 3x4 + 13x3 + 4x2 – 21x – 7 Combine like terms. 35 Check It Out! 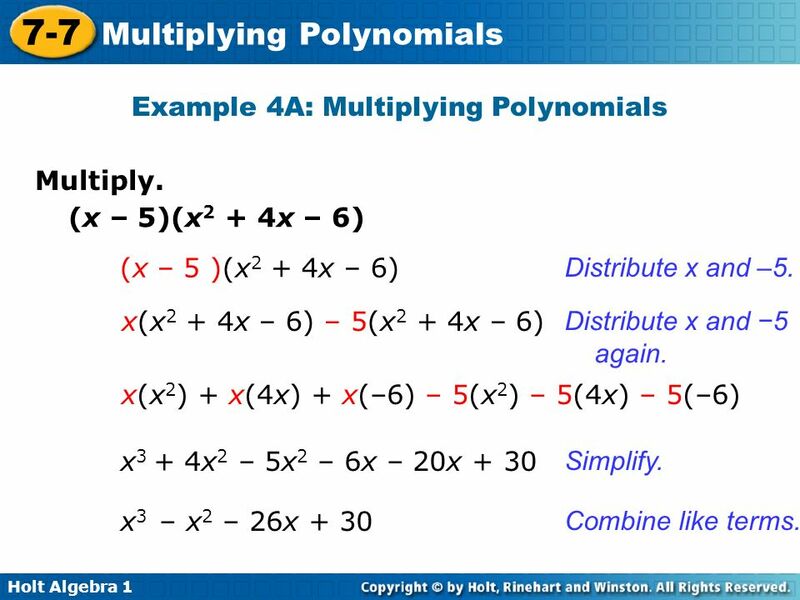 Example 4a Multiply. (x + 3)(x2 – 4x + 6) (x + 3 )(x2 – 4x + 6) Distribute x and 3. x(x2 – 4x + 6) + 3(x2 – 4x + 6) Distribute x and 3 again. x(x2) + x(–4x) + x(6) +3(x2) +3(–4x) +3(6) x3 – 4x2 + 3x2 +6x – 12x + 18 Simplify. x3 – x2 – 6x + 18 Combine like terms. 36 Check It Out! 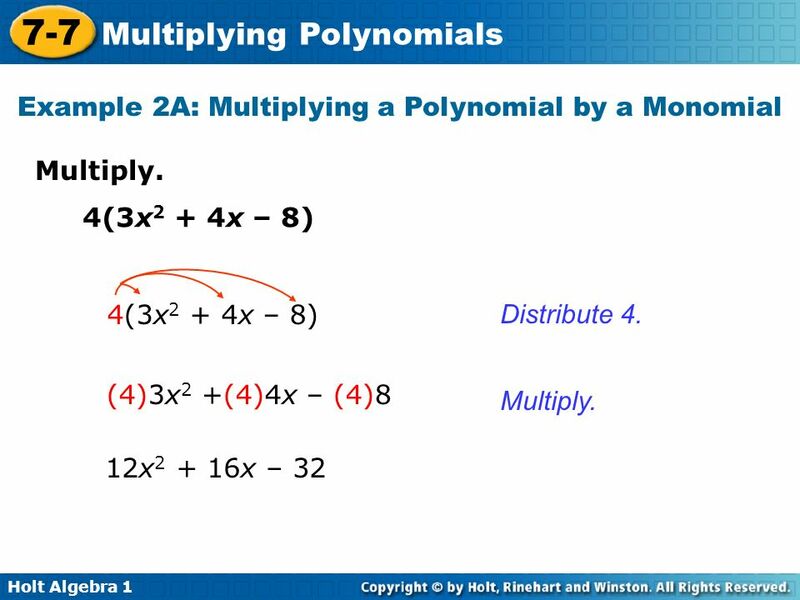 Example 4b Multiply. 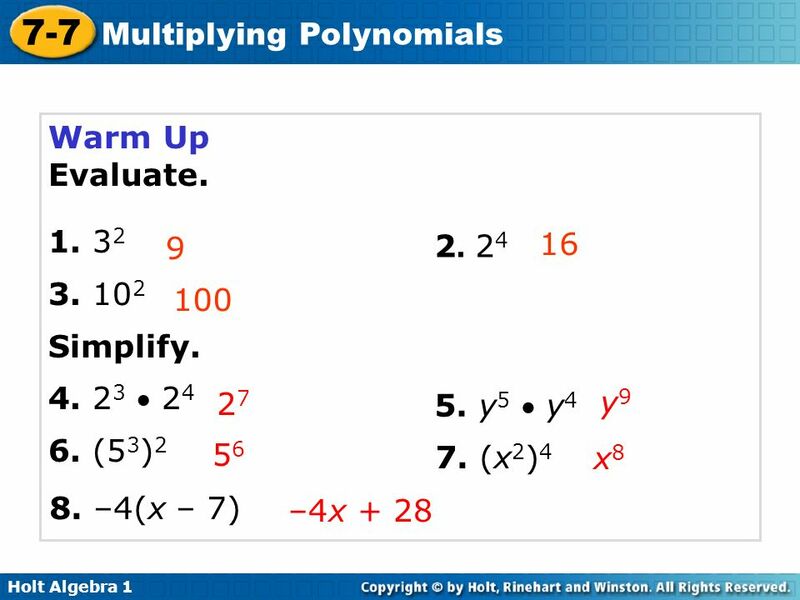 (3x + 2)(x2 – 2x + 5) Multiply each term in the top polynomial by 2. 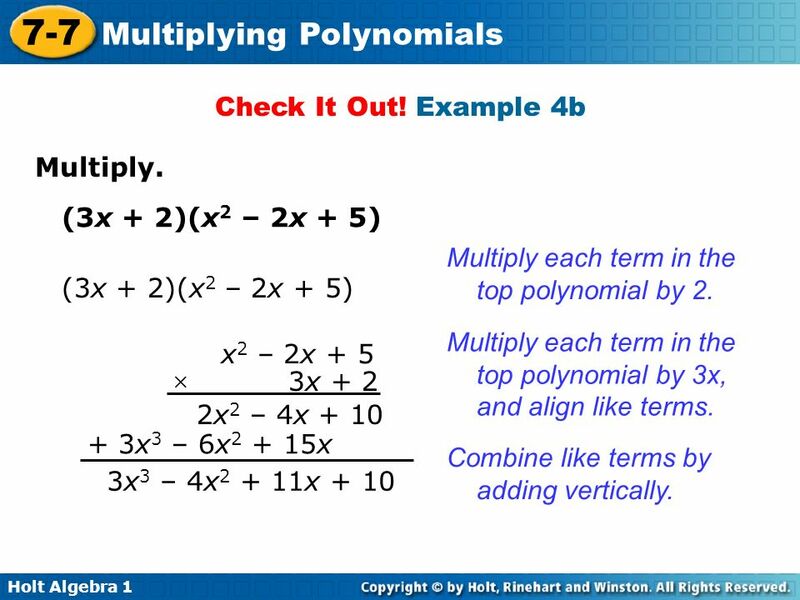 (3x + 2)(x2 – 2x + 5) Multiply each term in the top polynomial by 3x, and align like terms. x2 – 2x + 5 3x + 2  2x2 – 4x + 10 + 3x3 – 6x2 + 15x 3x3 – 4x2 + 11x + 10 Combine like terms by adding vertically. 37 Write the formula for the area of a rectangle. Example 5: Application The width of a rectangular prism is 3 feet less than the height, and the length of the prism is 4 feet more than the height. a. 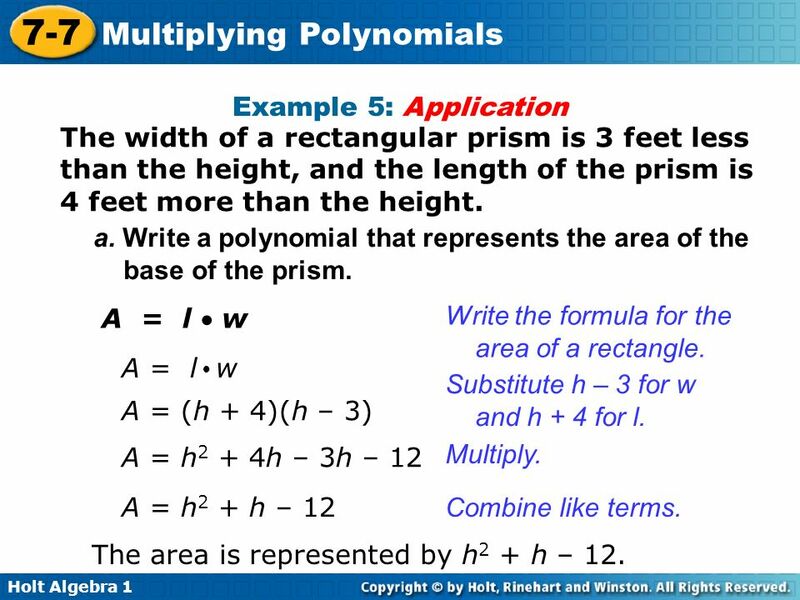 Write a polynomial that represents the area of the base of the prism. A = l  w A = l w  Write the formula for the area of a rectangle. Substitute h – 3 for w and h + 4 for l. A = (h + 4)(h – 3) A = h2 + 4h – 3h – 12 Multiply. A = h2 + h – 12 Combine like terms. The area is represented by h2 + h – 12. 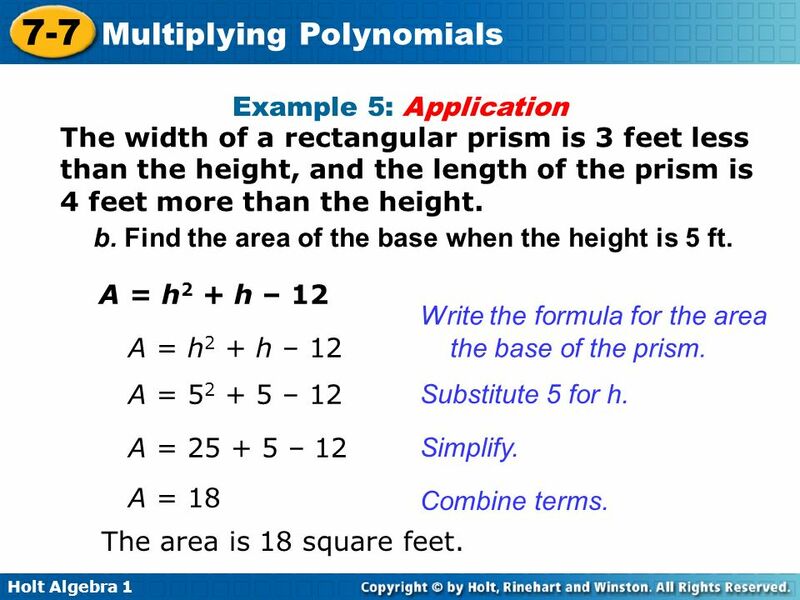 38 Example 5: Application The width of a rectangular prism is 3 feet less than the height, and the length of the prism is 4 feet more than the height. b. Find the area of the base when the height is 5 ft. A = h2 + h – 12 Write the formula for the area the base of the prism. A = h2 + h – 12 A = – 12 Substitute 5 for h. A = – 12 Simplify. A = 18 Combine terms. The area is 18 square feet. 39 The length of a rectangle is 4 meters shorter than its width. Check It Out! 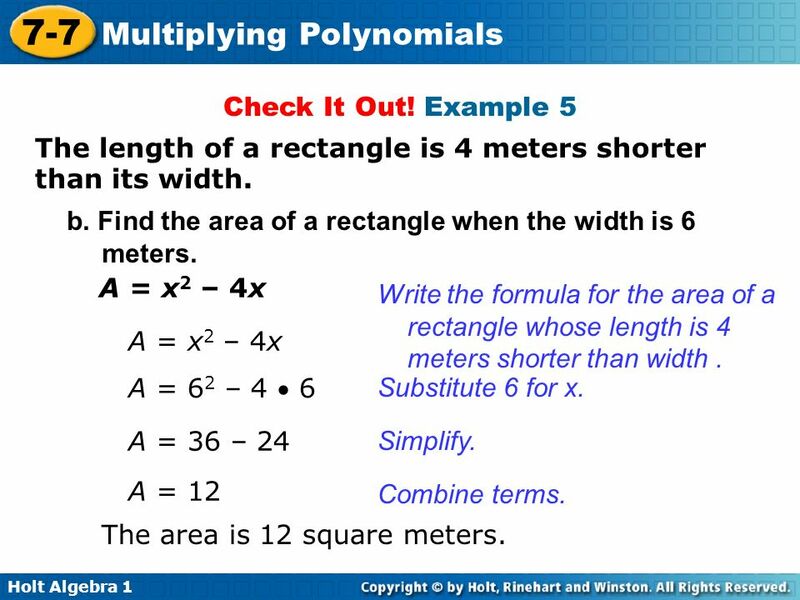 Example 5 The length of a rectangle is 4 meters shorter than its width. a. 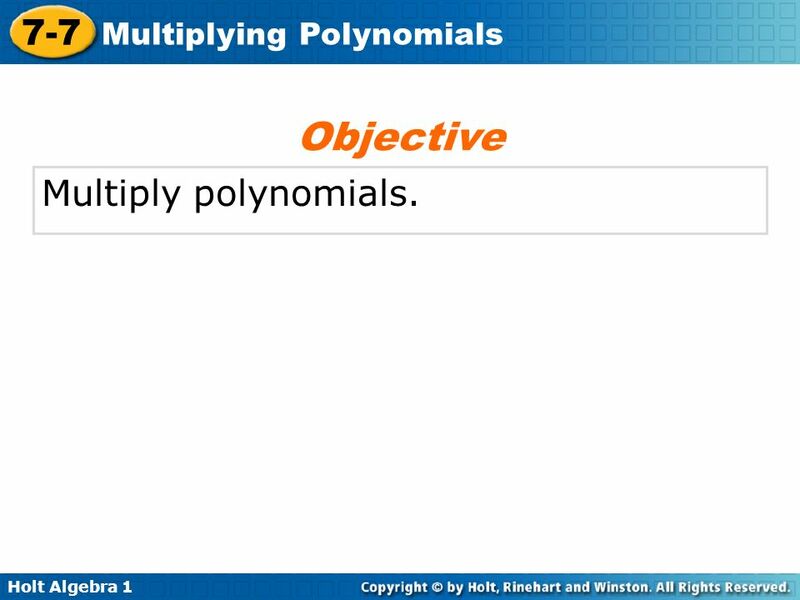 Write a polynomial that represents the area of the rectangle. A = l w  A = l w Write the formula for the area of a rectangle. Substitute x – 4 for l and x for w. A = x(x – 4) A = x2 – 4x Multiply. The area is represented by x2 – 4x. 40 Check It Out! 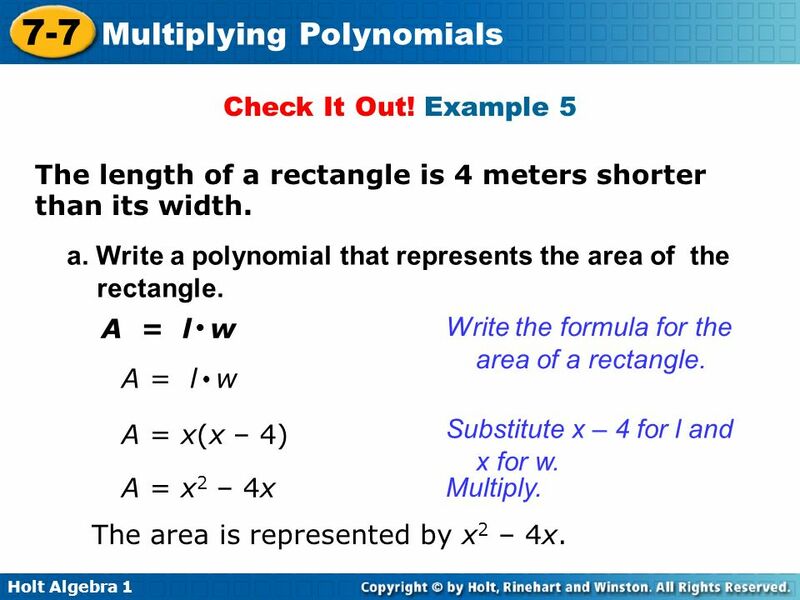 Example 5 The length of a rectangle is 4 meters shorter than its width. b. Find the area of a rectangle when the width is 6 meters. A = x2 – 4x Write the formula for the area of a rectangle whose length is 4 meters shorter than width . A = x2 – 4x A = 62 – 4  6 Substitute 6 for x. A = 36 – 24 Simplify. A = 12 Combine terms. The area is 12 square meters.